Today’s COTD is Kai’s Dragonic Waterfall featuring Sentinel restrict. AUTO (VC) When placed, choose an opponent’s grade 2 or higher rear-guard, and retire it. 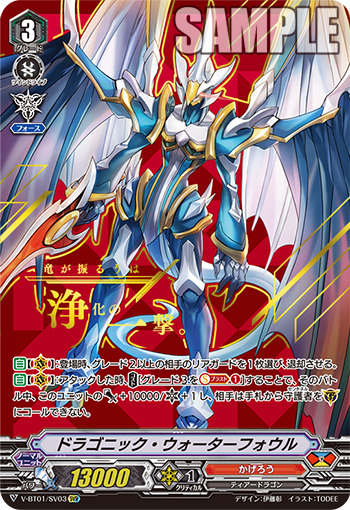 AUTO (VC) When it attacks, COST: [Soul Blast 1 Grade 3], this unit gets Power+10000/Critical+1 and your opponent cannot call Sentinel to (GC) from his or her hand until end of that battle.